Please click on the above links for more details. 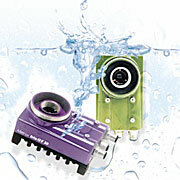 Matrox – world leaders in imaging products and systems – offers a range of programmable smart cameras. These combine the integration capabilities of conventional smart cameras with the flexibility of PC-based machine vision systems. Developers can create their applications using either an intuitive flowchart-based integrated development environment or a software development kit and run them directly on the smart cameras. Click the links to get more details about the camera. 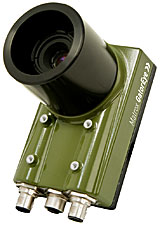 Matrox GatorEye is a GigE Vision® industrial camera family with an IP67 rating. The Matrox GatorEye IP67-rated GigE Vision® industrial camera family is designed for use in damp and dusty environments such as glass bottle manufacturing, or environments where the processing equipment is subject to frequent wash down such as food and beverage plants. The Matrox GatorEye is fully integrated, eliminating the need to separately source a sealed camera housing. Moreover, the housing provides easy access to the lens, avoiding the hassle of having to remove the whole camera from a sealed housing to adjust the lens. The Matrox GatorEye camera can operate on a separate 12 to 24 Volt input, the latter the most typically found in electrical cabinets on plant floors. Cabling is further simplified by making use of a camera’s Power-over-Ethernet (PoE) capability, which enables power and data transmission over a single cable. driving a LED illuminator, eliminating the need for a separate controller, which reduces costs and simplifies integration. In addition, the Matrox GatorEye offers eight GPIOs for directly interacting with other automation devices including a rotary encoder. For triangulation-based 3D digitizing applications, the Matrox GatorEye extracts the laser line in an image to sub-pixel accuracy and produces the corresponding positional depth/height array. Only the resulting array is transmitted, which lightens the load on the Gigabit Ethernet link and PC. The PC can then focus on other tasks, including 3D measurement and analysis.